Symbiosis Institute of Business Management Bengaluru (SIBM-B) hosted“Management Day” on 6th March, 2014. In the six years of its establishment,SIBM Bengaluru has carved out a niche for itself in the field of business education. The convocation ceremony held as a part of the Management Day was a vindication, a declaration to the outside world about the great wealth that is present in terms of human capital at SIBM Bengaluru. This celebration of human capital was further enhanced by the presence of Mr. Mittu Chandliya, CEO, AirAsia. Mr. Mittu Chandliya was the chief guest for the occasion. He is a passionate & energetic global business leader specialized in people leadership, strategic marketing& general management. He has a vast expertise in end to end P&L management.He holds a Bachelors degree in Sciences with three majors from Lehigh University, Pennsylvania and an MBA from the INSEAD business school. In his address to the current batch and the outgoing students, he talked about his life journey and how he became what he is today. He emphasized on the importance of parents in our lives and the values that they impart to us. He discussed and elaborated his five principles: Be an entrepreneur, never run from a crisis, always be confident and bold, make yourself technologically sound and always work upon your weaknesses. He had a very interesting question and answer session with the students. 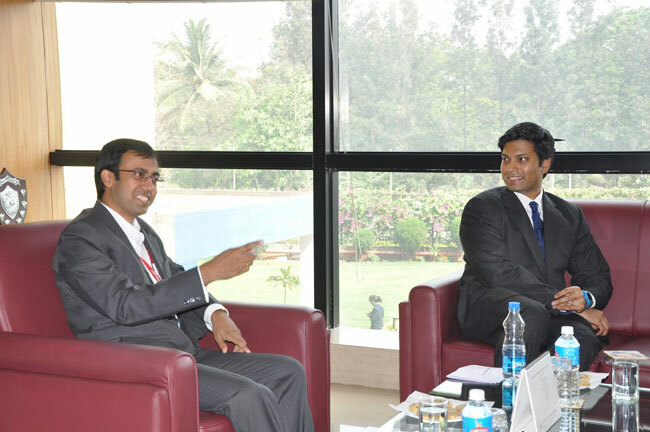 In his responses, he talked about his plans for AirAsia India and how is he planning to take it forward. He also talked about his style of working and how he plans and manages a business. On being asked by a student about the biggest challenge of his life, he replied, "Maintaining Work - Life Balance" which is something all students can connect with. The outgoing students were appreciated by the Director, Dr. Rajesh Panda and Deputy Director, Dr. V.V. Ajith Kumar for all the efforts that they had put in and for the laurels that they brought to SIBM, Bengaluru. Dr. Rajesh Panda urged the students to always stay inquisitive and childlike and live life to the fullest. He presented his heartiest congratulations to the outgoing batch for entering the corporate world and advised them to maintain a balance between their careers and personal life. This was followed by the award ceremony in which students were felicitatedfor excellence in both the academic and the non - academic arenas. This was accompanied by the appointment of the new Student Council for the session 2014 - 2015. Dr. Rajesh Panda, Director, SIBM Bengaluru quoted, "I am highly grateful to Mr. Mittu Chandliya for gracing Management Day with his presence and interacting with the students. His presence was highly motivational for each one of us.I also wish the students of 2012-2014 batch success in all their endeavors and hope that they will rapidly climb the corporate ladder."